Subject: Your $35.5 million dollars is ready to be released, reconfirm your details to check if it tallies with what we have in our system. it tallies with what we have in our system to avoid any mistakes ok.
and non-existed and will be treated accordingly. 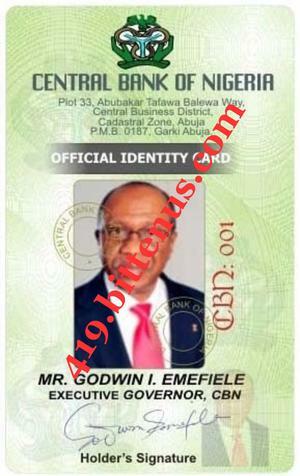 Subject: Letter To All Affected Beneficiaries,CONGRATS,(YOUR TRANSFER NOTIFICATION)URGENT,FROM,DR.GODWIN EMEFIELE,GOVERNOR,CENTRAL BANK OF NIGERIA,(CBN). The Central Bank of Nigeria (CBN) in conjunction with the Federal Government of Nigeria has decided to inject another 100 Billion United States Dollars to authorized dealers as its intervention to stabilize the foreign exchange in order for the Federal Government of Nigeria pay up all the affected debts owe to Beneficiaries / Contractors and Lottery Winners who over the years has been spending their hard earned money with out receiving their contract, lottery and beneficiaries fund payment. Please kindly respond immediately to this information if you are willing and ready to receive your fund under 3 official banking days. Contact us for further information. Note, act fast if you really want to receive your fund ( payment) of $15.5m,us . Please confirm as stated above. CONTRACT NO: NNPC/PED/876CX - WR/KAD/94. CONTRACT AMOUNT: USD200 MILLION US DOLLARS. This is to inform you that your Contract Payment with interest of $200 million that has been transferred to Washington Trust Bank in states in your name but because of your inability to finance your payment Federal Government of Nigeria /United States Government and Washington Trust Bank President and CEO (Mr Peter F. Stanton) have concluded to cancel and send your $200 million back to Nigeria suspend account as unclaimed payment any time from now but I pleaded to them to give me today to here from you before cancellation of your $200 million which i will not be happy if you allow them to cancel it after all what you and i have done in getting this Great Project up to this last stage. I quickly Contacted an investor NAME:Mrs ELIZABETH BROWN a United States Citizen she promised to loan you all the fees to secure your Tax Clearance Certificate /Source of fund Certificate(SFC) from Country of Origin of your $200 million Nigeria Government and Transfer Perrmit Certificate(TPC) from office of Presidency United States Needed by Washington Trust Bank before they will transfer your $200 million to your nominated bank account or they will open online account or release your payment via Atm card any one you choose but this Certificate is what you will pay to the Government of Nigeria to secure the certificate needed .and that is the purpose of the loan you are not going to pay any cent from your pocket now just provide the bank of America needed information's bellow and i will link you up with the investor Mrs ELIZABETH BROWN today. Now you are not going to pay any cent from your pocket hence the investor in states will loan you all the fees to pay the fees only if you have an account with Bank of America,If you dont have bank of America account HERE IS THE INFORMATION SHE NEED FROM YOU BEFORE THE LOAN. ACCOUNT NAME. . . . . . .
ACCOUNT NUMBER. . . . . . .
ACCOUNT HOLDER ADDRESS. . . . . . . . .
LAST 4 DIGIT OF ACCOUNT HOLDER SOCIAL SECURITY NUMBER. . . . . . . . CELL PHONE NUMBER . . . . . . . . . . . . . . . Provide the needed information's today to enable her loan you the fees and take note this loan is to secure the needed Certificate from Nigeria Government to enable Washington trust bank transfer your $200 million next week . Congratulation once again and call me as soon as you receive this massage . Attach is my working id card for your authentic recognition . YOU MUST CALL ME NOW ON PHONE AS SOON AS YOU RECEIVED THIS MASSAGE. IMPOSTORS, WE HEREBY ISSUE YOU WITH OUR CODE OF CONDUCT, WHICH IS (805) SO YOU HAVE TO INDICATE THIS CODE WHEN CONTACTING THIS OFFICE. C.B.N DEBT PAYMENT NOTICES OF YOUR FUND. of $15,000,000.00 Million and has been approved already for Payment. has been working with the CBN as a beneficiary since. email this Bank immediately you receive this Confidential Letter. The Central Bank of Nigeria hereby confirms to you that your fund has been cancelled to be paid to you via cash payment procedure in your country andre-approved to be paid to you byCertified Bank Draft which has been issued to you by the paying bank, The Emirate Bank in UAE. In this regards, you are expected to call the Payment Release Centre director, MR. SAMUEL AUGUSTINE so that he can be able to have the Certified Bank Draft sent to you at your receiving address in your country, if possible you can go to UAE by yourself and have your Certified Bank Draft received from Payment Release Centre director in UAE so that everything about this transaction will be concluded. You are advice to call the Payment Release Centre directly through his direct telephone number + 971524351717 . Make sure you call him on receipt of this message and send him your receiving address together with your telephone number for your own good while attached is the scanned copy of your Certified Bank Draft issued to you by the Emirate Bank which will be cashed in your bank as soon as you have it received. The Central Bank of Nigeria hereby confirms to you that your message has been received and duly noted. This is to inform you that your Certified Bank Draft has been issued to you via our paying bank, the Emirate Bank of UAE in which you are strictly advise to contact the Director, Payment Release Centre in UAE, DR. SAMUEL AUGUSTINE via his official email address: sdirectorofficeuaxx@gmail.com and also call him through his direct number: + 971524351717 in UAE and tell him you are one of the beneficiaries and also you can send him a copy of this said draft to enable him identify you as a legitimate person. Furthermore, you are not advise to have dealings with anybody or institution here in Nigeria because your payment has been directed to be paid to you by the paying bank in UAE in which you Certified Bank Draft has been issued to you. That is the reason why you should make sure you have the Payment Release Centre director contacted through his above telephone number and email address so that everything about this transaction will be concluded as soon as you give him your maximum co-operation. He will not have any excuse to have this transaction finalized with you and have the report submitted to the Central Bank of Nigeria that you have received your fund without any hitch of which you are rest assured. The Central Bank of Nigeria hereby anticipates hearing from you on the receipt of this message for your own good.